This monster is the otherworldly incarnation of Walter Sullivan, created from Walter’s own remains. Henry Townshend discovers a normal, human version of these remains in a hidden room behind his apartment shortly after he returns from Room 302 of the Past. Just before the final boss fight, the human corpse turns up missing. The Conjurer appears along with Walter’s Ghost, which appears just like the real Walter before his death, while the third part of Walter’s being, Young Walter, is elsewhere. Henry confronts these two parts of Walter Sullivan in a great chamber he finds after descending into a hole below where Walter’s corpse secretly resided. During Henry’s battle with Walter, Eileen Galvin, in a possessed trance, slowly walks toward an instantaneous death in a huge vat of blood housing a gigantic, revolving, spiked contraption that resembles an Armillary sphere. It is in this arena that the final boss battle takes place. The Conjurer’s appearance is that of a monstrous, humanoid corpse draped in gray, rotten flesh that doesn’t quite fit over its body correctly. It is suspended from the ceiling by chains and long strands of tubing similar to umbilical cords. Only the creature’s top half is seen, as the rest of it descends into the blackness surrounding the ring-shaped arena. When Walter dies once and for all, the Conjurer roars in pain and Walter himself passes away, begging for his mother one last time. Young Walter fades as well, along with the Conjurer. The creature itself doesn’t pose a threat to Henry during the battle, but as long as the Conjurer remains intact, Walter’s Ghost, the true threat, will be invulnerable to attack. When Henry uses Walter’s original umbilical cord on the creature, it cries out, apparently forcing Walter to recall past trauma discovered earlier. 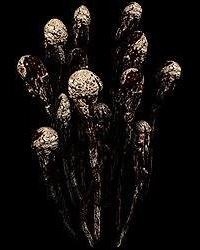 This unlocks the eight Spears of the Holy Mother surrounding the arena, each of which is embedded into a silhouette of one of Walter’s victims. Each spear must be collected and jabbed into the creature (it is suggested that Henry go into battle with at least four item slots free). When all eight spears are used, the creature cries out again and goes limp, rendering Walter’s Ghost mortal and able to be slain. Walter fights as he does in his Ghost appearances, wielding a pipe and a handgun, both of which are fairly dangerous. He can also take a great deal of damage, much more than any other ghost or enemy in the game. During this entire fight, Eileen is walking towards the pit off the scaffolding she stands on. Her speed depends on how much damage she has incurred over the course of the game. Whether or not she sacrifices herself before Walter’s defeat affects the ending of the game. The Conjurer represents a facet of Walter’s soul and being, as well as his desires and state. The Conjurer is nestled deep within the Otherworld of Room 302, which Walter believes to be his mother. As such, the Conjurer is symbolic of Walter returning to his “mother’s” womb. It also shows Walter’s “monstrous” nature, as opposed to Young Walter, who displays Walter’s former self and good qualities. 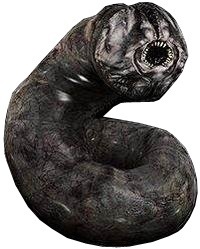 Greedy Worm is the name of a type of monster that debuted in Silent Hill 4: The Room and then reappeared as an unkillable monster in Silent Hill: The Arcade. Although they are not a particular threat or even dangerous, they are indeed a creature and a manifestation of Walter Sullivan’s worlds; Greedy Worms are commonly seen throughout these worlds, burrowed into the walls and floors of the structures and seemingly feasting on something. They can also be seen hanging and even occasionally moving dramatically. They are massive worms of varying lengths easily the size of sewer pipes, with massive tooth-filled maws. They never attack Henry Townshend, or even block him, but they can be attacked (just not killed). They link all of Walter’s worlds, spanning dimensions like umbilical cords. They represent Walter’s dismay of being separated from his mother and her “magic cord”. The name hints at Walter feeling as though he was a lowly parasite to his real mother, the umbilical cord being a “greedy worm” that stole nourishment from her. These feelings may have originated from the careless treatment and abandonment of him after he was born, and would help facilitate the belief that the room was his real mother. 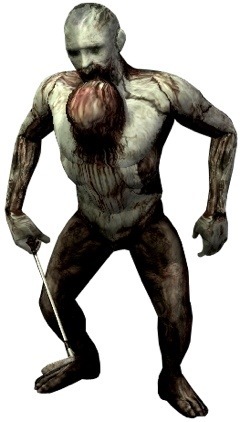 A Gum Head, also known as a Rubber Face, is a type of monster in Silent Hill 4: The Room. They are ape-like beings that are often found in groups. Gum Heads have gray, mottled skin that appears to be decaying. Their faces appear somewhat human, however they make monkey-like screeching and grunting noises. They also have a tendency to steal golf clubs or pipes from Henry Townshend if he is carrying any, which can be retrieved once Henry has killed them. They come in two varieties, called Old Types and New Types. Old Type Gum Heads are completely gray and are much more common. They have large tumors growing out of their throats, which almost appear like another head emerging. The New Types have red patches on their bodies that appear like scrapes and cuts and the tumor-like appendage is now a bloody red. They also appear in Silent Hill: The Arcade. Gum Heads of both varieties behave in the same fashion. They have two walking modes, one of which is bounding around quickly on all-fours, and the other is shambling slowly on two. Their primary method of attack is to strike with their arms and bite Henry; however, they can inflict greater damage if they happen to procure a weapon. New Types are much more likely to carry a weapon, and are faster on the attack. Gum Heads are implied to be stupid, and behave as such. They are a manifestation of Walter Sullivan’s views of the majority of society and his fear of adults as a child. 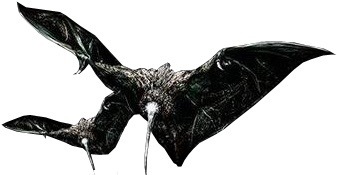 Mothbats, also known as Hummers, are flying creatures from Silent Hill 4: The Room. They appear as small, black mixtures between hummingbirds and bats. Their bodies are much like that of a bat, though they have long needle-like beaks similar to that of a hummingbird. In addition, their wings flap extremely quickly, making a buzzing sound as they dart about. Mothbats usually show up in swarms and attack Henry Townshend on sight. They are not particularly dangerous alone, merely doing tiny bits of damage to Henry until they die. However, in swarms or in conjunction with other foes they can be quite irritating. Dealing with them is simple, as Henry can merely swat them out of the air and stomp on them to finish them off. However, if not crushed, they will quickly recompose themselves and begin flying again. They are the only creature that the Bug Spray weapon seems to have any kind of effect on. These creatures represent the annoying, various flying creatures that Walter Sullivan has a great distaste for; flies, bats, and certain birds all represented in a single creature. 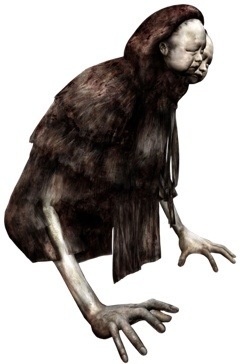 Patient is a type of enemy found in Silent Hill 4: The Room. They are large humanoid creatures, standing well over six feet in height and towering over Henry Townshend. They resemble a feminine monster with grotesquely distorted facial features. They have mottled grey skin with chunks missing from their bodies and wear bloody grey hospital gowns as well. They move very fluidly and lack the twitching movements common to many other monsters. They always wield pipes in their hands, with which they use to attack victims. Normally they make low-pitched breathing and growling noises, and when struck they make grunts that sound very much like belching. They are large, menacing opponents that attack relentlessly but slowly. They deal large amounts of damage and take an impressive amount of punishment as well. However, they are easily interrupted or avoided and can be defeated without much effort (but plenty of time) by a constant flurry of blows. They often appear in groups of two or more, making it much more difficult to defeat them. The Rusty Axe is the recommended method of dealing with them. Another method is to use Richard’s Revolver that you find in his apartment in the Otherworld, as it is capable of knocking down these enemies in 1-2 shots. The Patients are manifestations of Walter Sullivan’s aversion to hospitals and the like, finding them terrifying as the Patients themselves are imposing. Also the bloodstains on their hospital gowns makes it seems as though they are bleeding from where their wombs should be, suggesting that they are a manifestation of Walter’s hatred for his biological mother, as he seems to have taken both their lungs and wombs out. In the hospital world, Walter is seen disemboweling one by a horrified Henry; who runs away when he witnesses it. 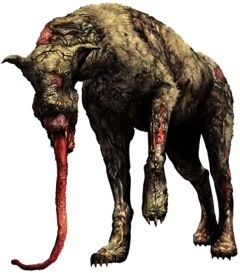 A common enemy in Silent Hill 4: The Room, the Sniffer Dogs are dog-type creatures that have long, prehensile tongues that they use to drain the blood of their prey. They have dirty, leathery skin which appears to be decaying and, strangely, make snarling sounds which resemble that of a large feline rather than a canine. Their gums are prominent and hold large, dagger-like canines. The male variety has visible eyes, ears and green tinted fur and flesh. Females are missing eyes and ears and are purple tinted, with longer, sharper claws. The gender and rank of the Sniffer Dog is betrayed by their coloration. Green-tinged Sniffer Dogs, thought of as males, are weaker and less threatening than the purple-tinged, thought of as female, variety. They serve the same function as Groaners and Double Heads from previous installments. The male Sniffer Dogs have green-yellow tinges to their skin and attack by charging up and lunging towards Henry Townshend’s torso. Female Sniffer Dogs, which have a purple-pink appearance, are much more intelligent and tend to detect Henry’s presence more quickly. The females are capable of grabbing onto the leg and pinning the player down while others of its companions attack him. The Sniffer Dogs often appear in groups and are usually witnessed feeding on other deceased monster carcasses. Their canine form is a reference to young Walter Sullivan’s fear of dogs after he visited a pet shop during his childhood and was nearly bitten by one. Additionally, their tongues bear a close resemblance to an umbilical cord, echoing Walter’s longing for his mother. The numerous animal noises the Sniffer Dog makes may also be a nod to the pets Walter killed in the pet store. The One Truth is one of the few bosses of Silent Hill 4: The Room. It is a larger, more powerful version of the Wall Man. It has the ability to scale up and down walls. Instead of appearing from the walls, the One Truth appears to be suspended inside of a metal square, with its flesh stretched out and attached to each corner. It has putrid, sickly skin as well, and much like Wall Men, does not have a distinct face. Its metal frame can scale up and down a pair of bars that support it, enabling it to escape from attack. The boss is fought along with several dummies of itself. In order for the player to win, Henry Townshend must find and defeat the One Truth, or the real creature, amongst the dummies. 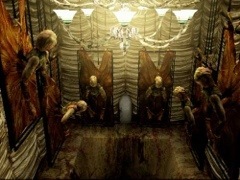 Similar dummies are later found in the Alternate Apartments near the end of the game. The One Truth attacks much like a Wall Man, swinging its powerful arms to knock Henry prone. However, its attacks do a good deal more damage. The biggest threat comes from its dummies, which are all but immortal and can also injure Henry. When the true One Truth is struck, all the decoys surrounding it also cringe. There are a total of 12 enemies- 11 dummies and the One Truth itself. In the rectangular room they appear in, there are 4 on the long halls and 2 on the small ones near the doors. The One Truth is the guardian of Walter Sullivan’s “mother”, appearing just before the final level. It is also generally representative of the twisted and mangled “truths” that the Order spreads. Toadstools are fungus-like creatures that inhabit the realms of Silent Hill 4: The Room. They are stationary and don’t pose much of a threat. Toadstools are tall, slender fungi that bulge out at the top of their stems, often equaling Henry Townshend’s height. The red-brown color of the fungus terminates in a fleshy patch, and sometimes they take the shape of a human head locked in a scream. Another nearly-identical variety exists called Whitestools. They function in the same manner as the Toadstool, differing only in that Whitestools are usually in tighter groups. They are white and tentacle-like which terminate in snake-like heads. They grow out of the ground to obstruct Henry’s path, though he can easily destroy them with a melee weapon to clear the way. They only do minor damage when Henry walks into them, and they themselves are destroyed in the process. Both variants are often seen growing out of corpses. These fungi represent what they are: fungi. Like fungi present in our own world, they are signs of decay and death. Their shape is also reminiscent of an umbilical cord, with a fetus growing at the terminus. Also like a fungus, Walter views umbilical cords as leeching nutrients from that to which they are attached. 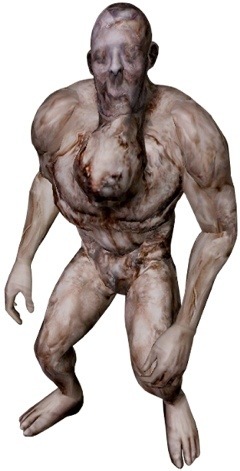 The Twin Victims (also known as Doublehead) are an enemy from Silent Hill 4: The Room. The creature appears to be a large set of sleeping Siamese twin infants wearing a tattered, dirty smock and what looks like a scarf. In addition to their game appearance, Twin Victims are also seen in Dead/Alive. In the Apartment World, another variant appears, called Bottoms that are naked, with their faces horribly deformed and their bodies a cancerous, lumpy, deformed mass of flesh. Bottoms also have a face dangling from the bottom of their torso, hence their name. They only attack Henry if he gets close; otherwise they merely stand stationary, pointing at him and whispering “receiver” over and over. Bottoms are slightly more dangerous than Twin Victims and are much faster and tenacious. The twins will point at Henry Townshend and whisper “receiver”, but they will not attack him unless he wanders too close to them or provokes them (i.e. shooting at or attacking), in which case they will lash out and strike at him with their long arms. After being disturbed, they will dart about the room fairly quickly, continuously harassing Henry and then running away until killed. They are capable of dealing heavy damage by hitting Henry or jumping on him. When they fall by being attacked, they start “sobbing” like young children. Walter Sullivan’s seventh and eight victims were twins Billy and Miriam Locane, who were first mentioned in Silent Hill 2. They are the only two of Walter’s victims that have been reincarnated into the form of a monster instead of ghosts. Although this makes sense for the creature’s origin, theres no official statement on why there are some of them in the game. 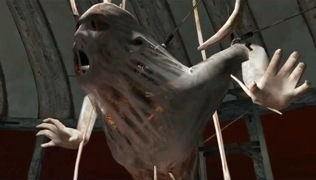 In the Official Strategy Guide by Piggy Bank Interactive, it is stated that the Bottom creature was created by Walter’s memory and hatred for the family that walked out on him.